The $2.00 Columbian, depicting "Columbus in Chains," is based on an 1841 painting by Emanuel Gottleib Leutze. The vignette was engraved by Charles Skinner and the frame and lettering by Douglas S. Ronaldson. 45,550 stamps were printed from Plate 105, and an unknown number were destroyed and never issued. 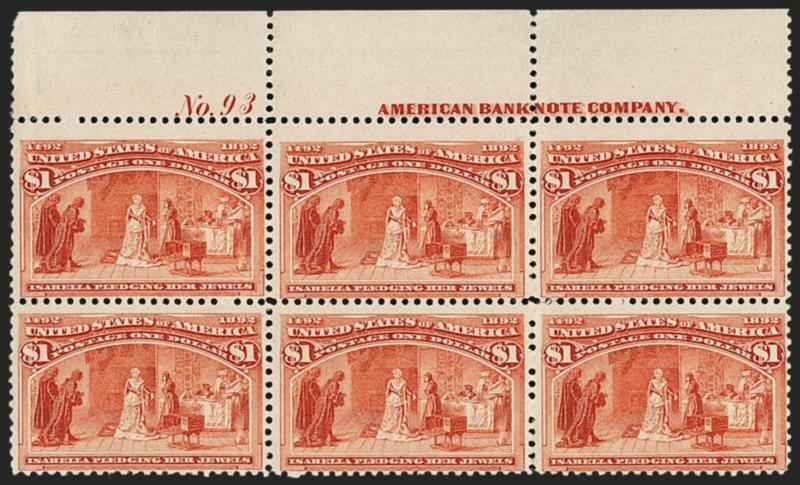 For the Columbian series, all of the 1¢ stamps and most but not all of the 2¢ stamps were printed from 200-subject plates, with horizontal guide arrows between the two panes of 100. The perforating machine simultaneously applied horizontal perforations and cut the 200-stamp sheets into panes of 100, normally leaving a trace of the guide arrow on the straight edge of each pane. 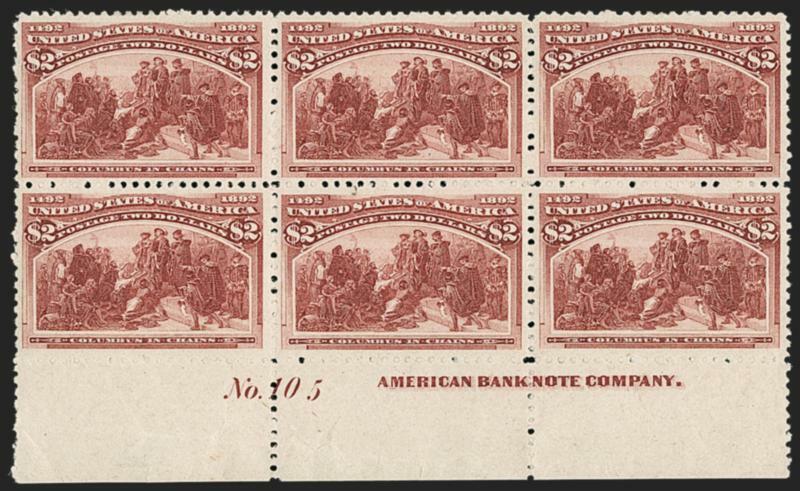 Some of the 2¢ stamps and all of the 3¢-$5.00 stamps were printed on smaller presses from plates of 100 subjects, with no guide arrows. When the perforating machine applied horizontal perforations to sheets from the 100-subject plates, the cutting blade, in the same position, removed either the top or bottom sheet margin (and plate number), depending on how the sheet was fed into the perforator, reducing by half the potential number of Columbian plate blocks that might have been available to collectors. This is also why so many Columbian stamps are reperforated at top or bottom rather than at the sides--10 stamps from every 100-subject sheet (or pane) would have a straight edge at either top or bottom. The 100-subject sheets were then divided into panes of 50 for distribution and sale at post offices. 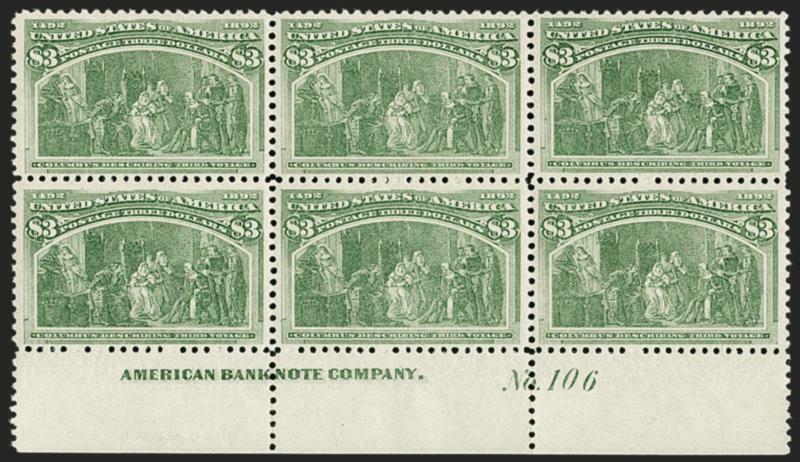 The undivided full sheets of 100 were only available from the Philatelic Agency in Washington D.C.
All of the values printed from 100-subject plates are known with both top and bottom plate blocks except for the 50¢ and $4.00, from which only bottom plate blocks are known. As explained, depending on how the sheet was fed into the perforator, either the top or bottom selvage was cut away and a straight edge was left in its place. For the 50¢ and $4.00, it appears that the entire supply was fed into the perforator in the same manner, preserving the bottom selvage and eliminating all top plate blocks (or any kind of top selvage). 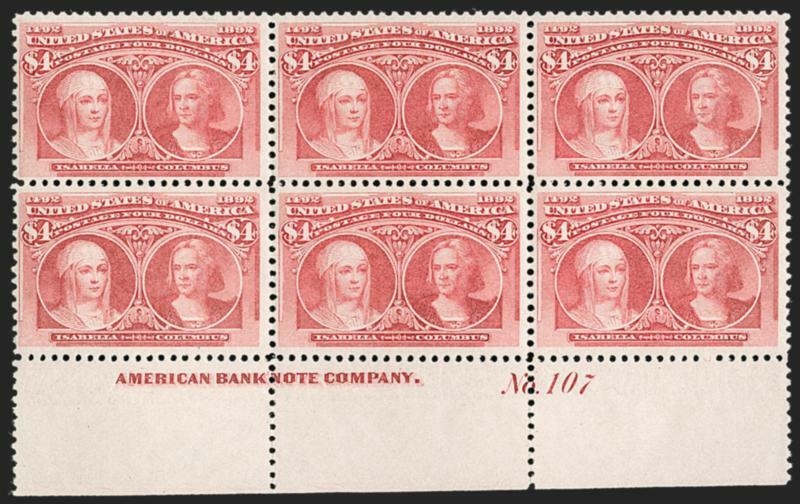 It is interesting that top and bottom plate blocks of the other dollar values exist. The $3.00 Columbian, depicting "Columbus Describing Third Voyage," is based on a painting by Francisco Jover y Casanova, reported to be in a museum in Spain. The vignette was engraved by Robert Savage and the frame and lettering by Douglas S. Ronaldson. 27,652 stamps were printed from Plate 106, and according to Luff 2,937 were destroyed. The $4.00 Columbian, depicting "Isabella--Columbus," is based on an unknown portrait of Queen Isabella and a portrait of Columbus from a painting by Lorenzo Lotto. The vignette was engraved by Alfred Jones and the frame and lettering by George H. Seymour. 26,350 stamps were printed from Plate 107, and according to Luff 3,357 were destroyed. 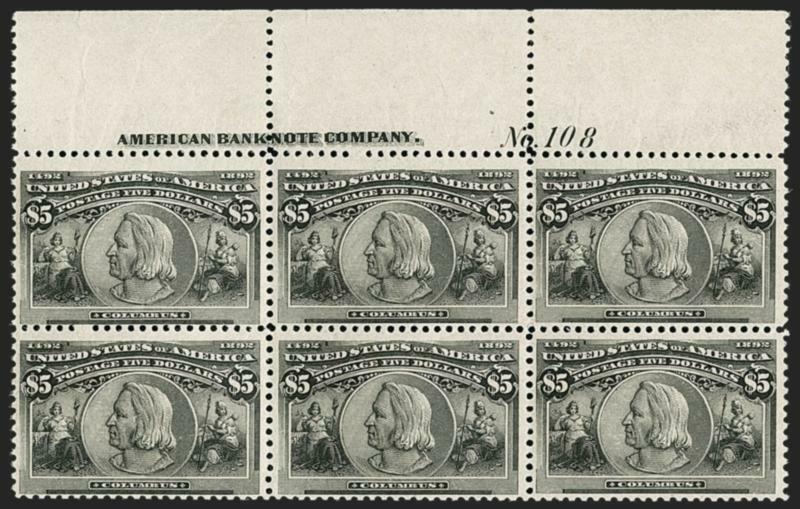 As block of 10: William H. Crocker, Harmer, Rooke sale, 11/23-25/1938, lot 417, as a block of ten described as "immaculate mint condition and with full original gum"
The $5.00 Columbian, depicting "Columbus" is based on a portrait taken from a medal, possibly of Spanish origin. The same portrait design was used for the commemorative half-dollar issued for the 1893 Columbian Exposition. The vignette was engraved by Alfred Jones, the frame by George Skinner and Douglas S. Ronaldson, and the lettering by Ronaldson alone. A total of 27,350 stamps were printed from Plate 108, and according to Luff 5,506 were destroyed.